If you are looking for information about how your agents can work with Twitter-generated tickets, see Managing tickets from Twitter. Note: It can take up to 15 minutes for a ticket to be created from a tweet. Only administrators have access to the incoming tweets; however, once they've been converted to tickets all agent types have access to them unless you've otherwise restricted their access to certain types of tickets (by restricting them to an organization, or by customizing Enterprise agent roles to exclude this permission, for example). It's important to note however that once a tweet becomes a ticket it behaves just like any other ticket in Zendesk Support. The one exception to this is that you have the option of replying back to the Twitter user with a public tweet or moving the conversation to email. Note: Each Twitter ticket has a limit of 5,000 comments. 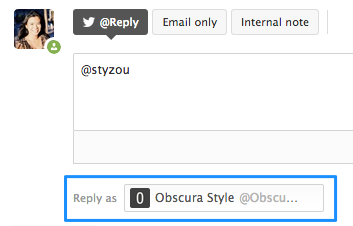 After reaching the limit, Zendesk stops importing new tweets as comments on the ticket. You can control if and how incoming tweets become tickets. 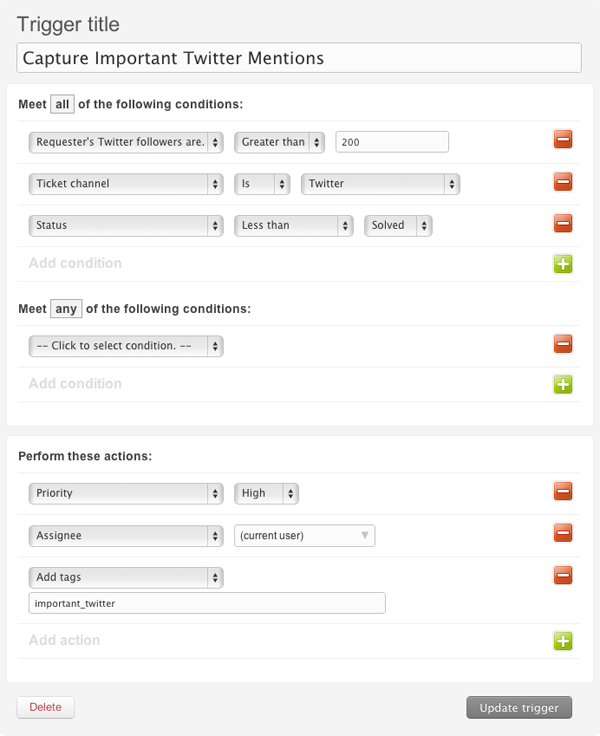 Here are several scenarios for managing incoming tweets and converting them to tickets. Likes. Convert tweets outside of Zendesk Support by liking them in your Twitter client. This approach allows you to manually choose tweets to convert before they ever reach Zendesk Support. Mentions and direct messages. Automatically create tickets from public tweets that contain your Twitter account handle or from direct messages. Sometimes, tickets that are not support requests and that don't need follow-up are created. You can manage these out of your ticket queue by manually solving and closing or deleting them. Triggers. Use one or more triggers to monitor new support requests that originate from your Twitter channel. You can use the trigger condition Ticket Channel, which has the following three Twitter sources: Twitter, Twitter DM (direct message), and Twitter Like. The advantage to this approach is that you have much more control over the creation and management of Twitter-based tickets. See Managing Twitter tickets with business rules below. Which approach you take might be based on your overall Twitter traffic or the number of administrators who are available to monitor and convert tweets, or the number of agents you have available to deal with support requests. You may want to use a combination of all of these approaches. To start, you need to add at least one Twitter account to your Twitter channel. You can add as many Twitter accounts as you need. For example, your company may have different Twitter handles for different aspects of the company (sales, support, operations, and so on). Note: You must be an administrator on your Zendesk account to perform the steps required to set up your Twitter channel. 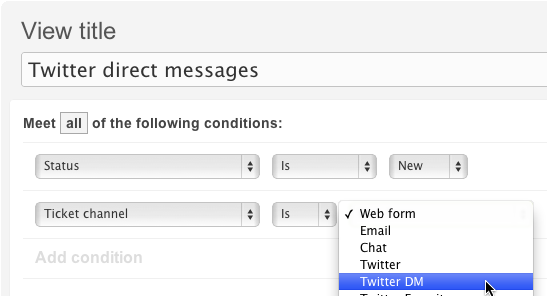 Click the Admin icon ( ), then select Channels > Twitter. Select the Twitter accounts tab. You'll be prompted to log in to Twitter and then authorize Zendesk Support to use your account. Enter your login information and then click Authorize App. After your account has been authorized, your newly added Twitter account will be listed on the Twitter accounts tab. You'll want to edit the account's settings to control how tweets to this account are handled (see Editing Twitter account settings for descriptions of the settings). By default any responses to a tweet will be from the account the tweet was directed to. You can select a different account from the Reply as drop-down list under the ticket reply box. If you want to automatically respond from one account, you can disable Allow replies via this account when editing your other Twitter accounts (see Editing Twitter account settings). As shown in the table above, you can choose to automatically convert public mentions and direct messages into tickets (Capture public mentions as tickets and Capture incoming direct messages as tickets). If you enable these, the option to manually convert tweets to tickets will no longer be available for that Twitter account. After you've added a Twitter account, you should configure some basic settings for the account. Click Edit beside the Twitter account you want to edit. The settings are described in the following table. This setting allows agents to use this Twitter account when replying to a Twitter ticket. Replies to tickets from Twitter retain the original inbound format. For example, if the ticket was created from a direct message (DM), then the agents reply from within Zendesk will also be a DM. If the ticket was created from a tweet mentioning your Twitter handle (for example @Zendesk), then the agents reply from within Zendesk will be a reply tweet, threaded to the senders original mention. Note: This setting appears in the Support interface when Allow replies via this account is set to yes. Use this Twitter account by default to reply to tickets that were created from tweets to your other Twitter accounts that don’t allow replies. When yes, the Reply as drop-down list shows the name of this Twitter account by default. However, agents can still choose a different reply-enabled Twitter account from the drop-down list, if desired and available. You can only have one default account at a time. Your old default account becomes a non-default account set to no. Setting a default Twitter account can affect bulk ticket updates in a few ways. If the Twitter account is the default account, agent replies are sent from that account. If a different, separate Twitter account is the default Twitter account, agent replies are sent from the default Twitter account instead of the account that the customer initially replied to. If there is a default Twitter account, agent replies are sent from the default Twitter account. If there is no default Twitter account, an error appears in Support because the Twitter account doesn't allow replies. For information about how to bulk update tickets, see Bulk updating tickets. This automatically converts any public tweet containing your Twitter account handle (for example, @mondocam) to a ticket. This automatically converts incoming direct messages into tickets so that your customers can contact you privately rather than publicly. Depending on your Twitter settings, you can either receive direct messages from anyone or only from Twitter users you follow. You can reply to anyone who sends you a direct message. This automatically converts a tweet that you like to a ticket. For example, if you're managing your Twitter stream using twitter.com, you have the option of manually liking the tweet by clicking the heart icon. Learn more about liking tweets in Twitter help. You can remove a Twitter account from your Twitter channel by deactivating it or unlinking it. If you deactivate an account, it is inactive in Zendesk Support and you can reactivate it at any time. If you unlink an account, it is removed from Zendesk Support. Click Deactivate beside the Twitter account you want to deactivate. The Twitter account is deactivated. It will not turn tweets into tickets and you cannot reply using it. You can reactivate account at any time. Click Unlink beside the Twitter account you want to remove from your Twitter channel. The Twitter account is unlinked. Another option for your outgoing Tweets is to append a shortened URL to the ticket you created from the tweet. This allows the Twitter user to access the ticket page in the Web portal via their Twitter account. In other words, remote authentication is used to log in through Twitter to Zendesk Support (end-users must sign in to Zendesk to see the ticket page). Once a Twitter user has access to the ticket page, they can add a longer comment than they could have in Twitter given the 280 character limit of a tweet. They can also update their user profile (adding their email address for example). Note: If you started using Zendesk on or after August 21, 2013, this option is not available until you activate your Help Center. See Getting started with Guide. You have the option of allowing the agent to decide if a shortened or the original URL is used in the response. And, you can choose one of several URL shortening services to use. Select the General settings tab. Enable the ticket links by clicking Yes next to the Append ticket links to outgoing tweets? option. If you want agents to decide when to use shortened URLs, deselect the Always include shortened ticket URL option. It is selected by default. A number of conditions are available to manage your Twitter tickets using business rules. Like the other Zendesk Support channels, you can detect a ticket's source using the Ticket Channel condition in automations, reports, triggers, and views. There are three Twitter source types you can use in the Ticket Channel condition: Twitter, Twitter DM (direct message), and Twitter Like. If, for example, you wanted to create separate views of each of the Twitter source types, you simply choose the Ticket Channel condition and then select the type. The Requester is verified by Twitter condition is a special type of Twitter account that has had its identity verified by Twitter (by submitting proof of business, for example). Knowing that a Twitter account has been verified may be important to you in determining how to handle Twitter tickets. For more information, see FAQs about Verified Accounts in Twitter help. And of course, you can also adds tags to your Twitter tickets and use them to manage your Twitter tickets through your workflow. Zendesk Support constantly monitors your Twitter accounts for new public mentions and direct messages. If Zendesk Support cannot connect with your Twitter account, it will send an email notification to all admins on your account . If you receive notification that your Twitter channel has become deauthorized, you need to reauthorize the affected Twitter account in Zendesk Support. To do so, click the Admin icon ( ) in the sidebar, then select Channels > Twitter. The password on your Twitter account has changed. The Twitter account no longer permits Zendesk Support to view its timeline and tweet on its behalf. This can happen if the Zendesk Support Twitter app has been removed from your Twitter account’s list of allowed apps. Zendesk Support receives a consistent response from Twitter indicating that we are not authorized to access your Twitter account’s content. This should only happen due to an error in Twitter’s platform. I've had this integration set up for a few months. My team is running into an issue where images/screenshots customers send require them to sign in to our main Twitter handle. We purposely haven't provided them that access for security reasons, but are hoping there's an alternative way they can view images that come through in DMs. Sadly this is not possible. In order to access the images the Agent would need to have a Twitter login.Twitter is a Plain Text channel in Zendesk, and as such unless it is viewable through Twitter itself which would require logging in, the agent would not be able to view.